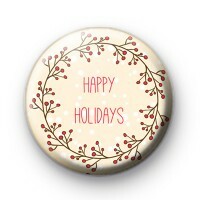 This is a listing for a 1inch festive themed pin badge. It reads Happy Holidays inside a winter Berry Wreath. Very cute for this time of year and a great way of getting into the festive spirit. Make sure you check out our huge selection of Christmas Badges - they're all handmade.